mitmproxy is an interactive TLS-capable intercepting HTTP proxy for penetration testers and software developers. It’s a console tool that allows interactive examination and modification of HTTP traffic. It differs from mitmdump in that all flows are kept in memory, which means that it’s intended for taking and manipulating small-ish samples. The command-line companion called mitmdump provides tcpdump-like functionality to let you view, record, and programmatically transform HTTP traffic. Replay the client-side of an HTTP conversations. Replay HTTP responses of a previously recorded server. Ubuntu comes with Python but we need to install pip, python-dev and several libraries. This was tested on a fully patched installation of Ubuntu 14.04. 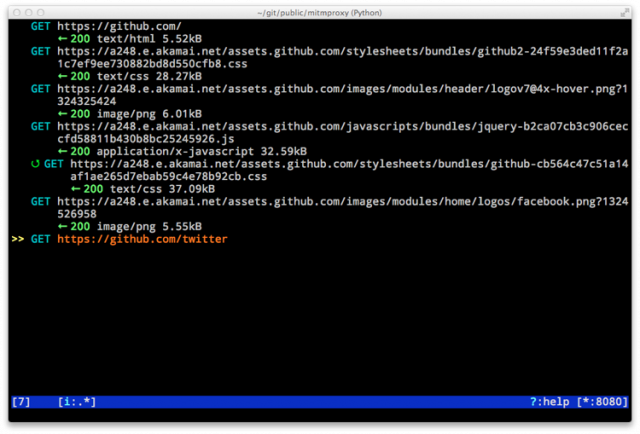 Once installation is complete you can run mitmproxy or mitmdump from a terminal. On Ubuntu 12.04 (and other systems with an outdated version of pip), you may need to update pip using pip install -U pip before installing mitmproxy.